The Aquarius mission was developed in an international partnership with Argentina’s space agency, Comision Nacional de Actividades Espaciales (CONAE), which has successfully developed three consecutive science application satellites in cooperation with NASA. Numerous university, corporate, government and international institutions are also involved in the Aquarius mission. For the joint mission, Argentina provided the SAC-D spacecraft and additional science instruments and conducts the mission operations. NASA developed and built the Aquarius salinity sensor and provided the rocket launch at Vandenberg Air Force Base in California on June 10, 2011 at 7:20M PDT. NASA’s Jet Propulsion Laboratory in Pasadena, California, managed the Aquarius Mission development for NASA’s Earth System Science Pathfinder program, and NASA’s Goddard Spaceflight Center in Greenbelt, Maryland, now manages the mission after launch. 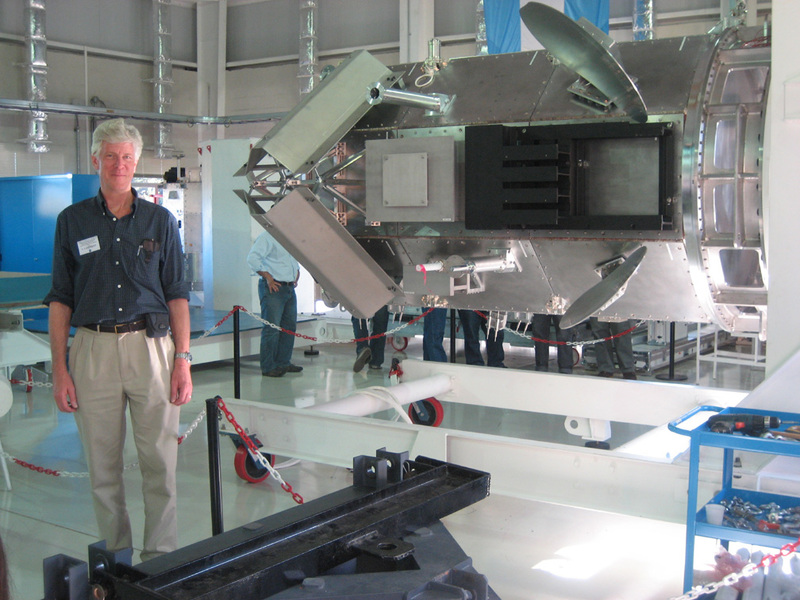 PI Gary Lagerloef next to the full scale SAC-D structural model, 27 Feb 08.